Discover next-level tactics to optimize your career and lifestyle in our high-performance community. Start achieving your career and lifestyle goals when you discover the truth about productivity -- it's so much more than doing more in less time. Hey there! I'm Marissa Brassfield, founder of Ridiculously Efficient® Inc.
I’m a productivity consultant, experience architect and secret weapon for visionary entrepreneurs. I've built a dream career in catalyzing teamwork between visionary entrepreneurs, strategists and creatives. My passion is to help high-performance professionals do their best work and live their best lives. I've done this through coaching and writing since 2011, and launched the Ridiculously Efficient Community in January 2019 to take this mission to the next level. 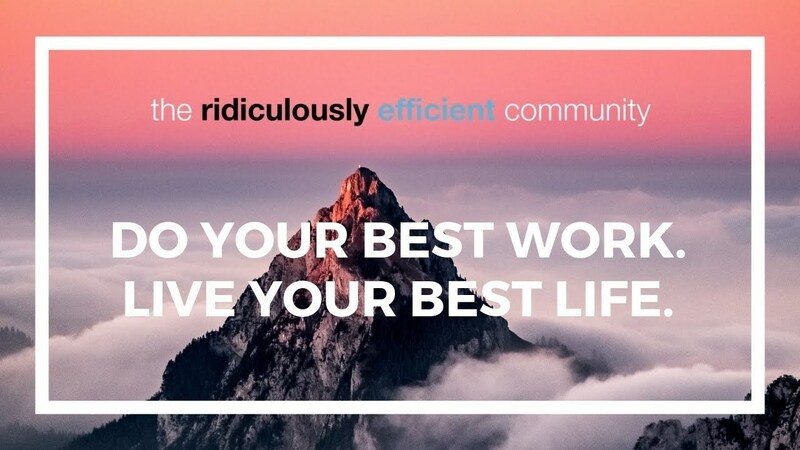 The Ridiculously Efficient Community is an extraordinary global tribe where entrepreneurs, creatives and integrators learn how to make the most of every moment. how to transition from "busy and burned out" to "fierce and fulfilled"
Inside the Ridiculously Efficient app and online platform, our thought-provoking conversations cover technology, the future of work, remote teamwork, and everyday lifestyle hacking. Our members spend about 7 minutes on the site each time they visit. This peer-to-peer microlearning isn't theoretical -- it's sharing tactical approaches that we're using in our lives and businesses today. And unlike the echo chambers you find in so many online communities, at Ridiculously Efficient, our diversity is our strength. As of March 2019, our members hail from the Americas to Zimbabwe. 1. Exclusive content and conversations. Our community is packed with expert perspectives and thought-provoking conversations, all aimed to inspire your best thinking. Our iOS and Android apps keep you connected, wherever you are. 2. Meet like-minded professionals. We're here to get better together. Try our Members Near You feature to network during your next conference or work trip, or join our Virtual Happy Hour meetups for informal fun. 3. Make better, more well-informed decisions about the things that are most important to you. Get selfish and ask your toughest questions about working and living excellently. Learn how others around the world are already optimizing time-consuming activities to make more room for adventure, creativity and impact. 🚀 The Ridiculously Efficient community contains a dynamic mix of elite achievers. Our global membership includes creators of all types: investors, entrepreneurs, nonprofit leadership, performance artists, trainers and coaches, writers, project managers and marketing all-stars. 💪 By joining this community, you'll get direct access to me and our Community Hosts. That means on-demand coaching calls, direct messaging, community webinars, exclusive courses inspired by your problems, and IRL events. You’re not here for homework, or advice you can find online for free. Us either. We share shortcuts, hacks and hard-earned lessons on how to take your work and life to the next level. Our members candidly share what’s worked, their favorite technologies and tools, and valuable life experiences. As a fully distributed, always-on network of expertise, the Ridiculously Efficient community is the most dynamic place on the planet to discuss productivity, work-life alignment and "adulting." How would your life change if you had a productivity coach in your pocket? Join the Ridiculously Efficient Community and find out. Memberships start at just $14.99/month or $149 per year — and you get a free 7-day trial to test us out. For far less than your ticket and travel to a leadership conference, a pricey online training series, or a few business coaching calls, you get real-time, always-on access to a global community of leaders. Your membership fee also includes a dynamic calendar of exclusive webinars, learning events, and live networking opportunities. And our dedicated iOS and Android apps ensure the Ridiculously Efficient community stays with you every step of the way. This community is about actionable growth, which is why we offer a 30-day money back guarantee. If you don’t find the Ridiculously Efficient Community to be full of intelligent, kind and generous high performers you can collaborate with to level up your work and life, let us know. We’ll gladly refund your membership fee. Just send a direct message to a Community Host inside the platform or email us at contact@ridiculouslyefficient.com. “Marissa has changed my life. Dead serious. I’m personally working more efficiently and feeling more energized at work. I’ve been inspired to optimize a long-term strategy for my foundation by leveraging technology and community. My confidence as a leader has improved because I no longer feel alone — I feel empowered and supported. All of this, because I invested in the Ridiculously Efficient community and began implementing Marissa’s strategies and tactics I’ve learned from other members. The mindset reinforcement alone makes this investment an automatic HELL YES for any growth-oriented professional." "It is not every day that we cross paths with someone whose vision is so sharp and well formulated that it can change the way we see things. That is exactly what happened to me when Marissa Brassfield and her Ridiculously Efficient platform came into my life. Whenever I encounter a professional situation that has me feeling stuck or unsteady, Marissa is a source I can turn to for clarity and guidance. She has an awe-inspiring way of helping me focus on key takeaways, while I successfully let go of the rest. Marissa and her RE community have helped me launch a successful freelance career, and have given me the courage to embrace my entrepreneurial spirit. I don't know where I would be without her." Ready to join us? Click here to Subscribe Now.